Eliza Webber Gebb and Warren Webber Gebb along with their friend Lily Kolm raised $130 and Malia Bodnar and Maeve Sheehan raised $70! In both cases, the kids initiated the project and decided on their own to donate the funds! 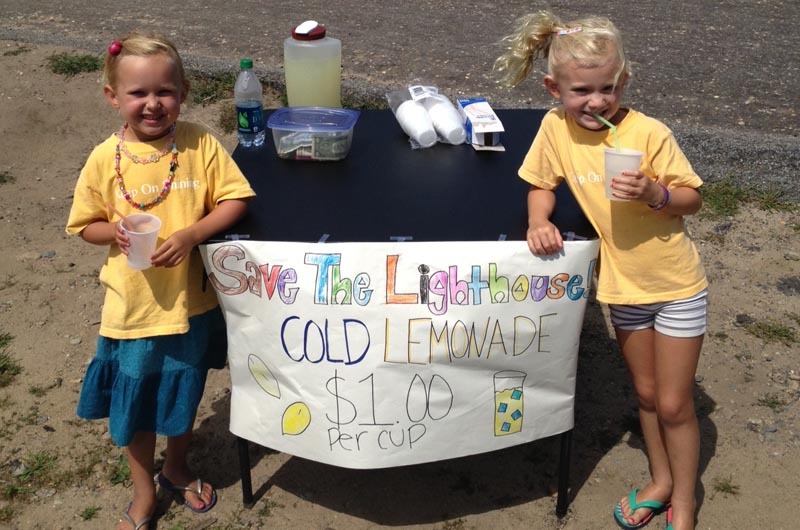 Kids love this lighthouse and they just wanted to help. The annual Aquinnah Wampanoag Pow Wow will be held this weekend at Aquinnah Circle on Saturday and Sunday with grand entry at noon on Saturday. No pets, no coolers and no alcoholic beverages allowed. Many vendor booths will be available for your shopping pleasure. Enjoy the dance, drum, raffles and more. The summer programs of the Aquinnah community programs committee, for which Betty Joslow is the chair and organizer, has completed another successful season of swimming lessons at Hannah Malkin’s pool each week with instructors Michael Wooley and his assistants Dave and Taylor. Charlie Shipway has completed the sailing program for the season. Thank you to one and all for making the programs such a success for the children of Aquinnah. Maxwell Butler of Boston has arrived home for a visit with his parents Lenny and Mallory, and his sisters Jeffie and Nina who are both here from Aspen, Colo., as well as his brother in law Kevin Sheehan, niece Maeve Quillin Sheehan and nephew Orrin Thomas Sheehan. Joseph Lee, son of Martha Vanderhoop and Marshall Lee, has left the Island after a short stay to return to school at Columbia University in New York city. Joseph spent most of the summer in New York working with an educational startup company called Wizoku. The company is a tutoring service and learning community that commits to supporting a girl in Africa or in Asia with a day of school for every hour of tutoring on their site. Sam Lee has also been visiting his parents recently. His band Magic Man will soon begin their fall tour with Walk the Moon. All the best to Ted Leslie upon his retirement as assistant manager at Transit Connection Inc., the management company for the Vineyard Transit Authority. Ted has been a vital part of the management for the past decade and will be greatly missed. Noah Mayrand of San Francisco has arrived home for a visit with his parents Mike and Carol, and his sisters Sonya and Alyssa. Welcome to the newest member of the Vanderhoop family as of yet to be named, a baby boy was born to Woody and Jamie Sue Vanderhoop at 3:33 a.m. on Tuesday Sept. 3 at the Martha’s Vineyard Hospital. Get well wishes to Sally Wiener who has been a patient at Martha’s Vineyard Hospital for the past week. It was a delight to spend some time with Sally and her friend Van Rogers the other day. Hopefully she will be home soon. L’Shanah Tovah as you observe the new year. Happy 2nd anniversary wishes to Chelsea Ives and Sean Kelley on Sept. 10. Happy 4th anniversary wishes to Jesse and Maggie Wiener on Sept. 12. Happy birthday wishes to my favorite son Paul Manning as he parties with family and friends on Sept. 7. Danny Mayhew parties on Sunday. Matthew Vanderhoop and Tyler Vanderhoop share the day on Sept. 9. Matthew Seeman parties on Sept. 10. Brian Little Buck Vanderhoop will party on Sept. 11. John McKinstry celebrates on Sept. 12. Jason Hobbs and Seamus Ritter Mahoney will share the day on Sept. 13.